In Ontario Canada 1796, the British began work on Fort George at Niagara-on-the-lake, on the opposite shore of the Niagara River from the American Fort Niagara. Completed in 1802, Fort George housed the British army, local militia, and the Indian Department. Fort George has now become known as one of Canadas most haunted locations, there are regular ghost tours around the grounds. It was a substantial installation, boasting six earthen and log bastions linked by a wooden palisade and surrounded by a dry ditch. Inside the walls, the Royal Engineers constructed a guardhouse, log blockhouses, a hospital, kitchens, workshops, barracks, an officers' quarters, and a stone powder magazine. Fort George was the scene of several battles during the War of 1812 with both sides suffering heavy losses. 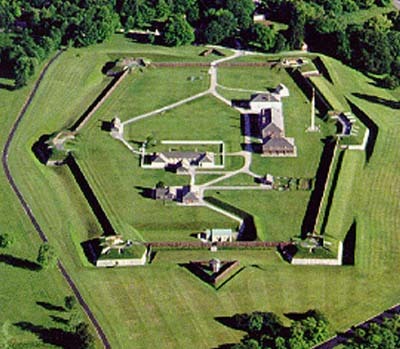 In May of 1813, the fort was destroyed by artillery fire and captured by the Americans. Most of the buildings suffered heavy damage and the British suffered heavy losses. 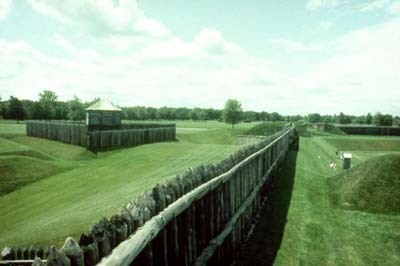 The Americans used the fort as a base for invading Upper Canada, but were forced to retreat after the battles of Stoney Creek and Beaver Dams. The fort was retaken by British forces in December and partially rebuilt. After the war, the fort was abandoned in favour of Fort Mississauga and Butler's Barracks. During the 1930's, the original plans of the Royal Engineers guided the reconstruction of Fort George as a National Historic Site. The fortification was used by the Canadian Army as a military training base during the First World War and through the Second World War under the name Camp Niagara. The grounds were eventually abandoned by the military in 1965. The stone Powder Magazine is the only surviving building from the original fort, and is the oldest military structure in Ontario. Most of the ghosts and spirits are found inside the Blockhouses they include that of a man walking across the upper floor, his footsteps are often heard by visitors. Several witnesses have reported seeing a grey haired, balding man peering out from behind the bunks. There have also been reports of a man dressed in white, reclining upon one of four bunk-beds. The ghost of a 9yr old girl, with shoulder length curly blonde hair, wearing a white flowing gown has been seen in the blockhouse her spirit is often seen by other children. Several visitors have spotted a child like translucent hand on the railing of the stairs, and a Caucasian man with dark features has been seen several times standing in a ground-floor window. The Officer's Quarters are known for the apparition of a young lady with long, slightly curly hair, seen in an original silver backed, gilt framed mirror from the 1790s. Footsteps can be heard shuffling through the halls, doors open and close on their own, and display railing gates have unlatched and opened on their own. On Campbell's Bastion, the apparition of the upper half of a solider has been been patrolling the perimeter, his musket held at the ready. After a recent ghost tour of Fort George a young lady explained that as the tour was leaving the fort at the end of the evening, she had seen a man standing beside the sentry box at the front gate. She describes him as a very skinny old man of perhaps seventy. He was wearing blue overalls and a red plaid shirt, and had very short grey hair which was slightly balding at the front. Although his cheeks were sunken and creased with wrinkles, there was a sparkle in his eyes as he smiled and waved as the tour filed by and moved out of the fort.